My interest in Ambersons began a number of years ago on a subway ride and a story that began in the early 1850s, when New York City was confined to the area below Washington Square Park. It was then that Mr. John Seaman built a huge marble mansion at the northern-most tip of Manhattan Island. Located at what is now 215 street—then considered bucolic countryside—the house Seaman built sat on 26 acres of exquisitely groomed landscape high on a ridge overlooking both the Hudson and Harlem Rivers. The estate included a chapel, greenhouses, stone stables, a trout pond and grape abhors. 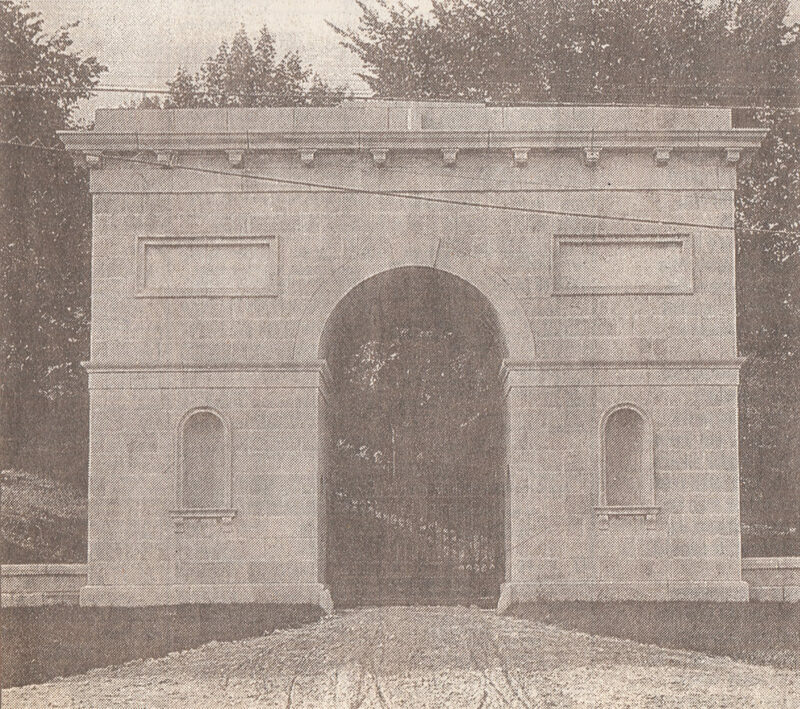 On what today is Broadway—then just a back country dirt road—at the foot of the long drive leading to the house, stood a huge marble arch entry way. So, huge in fact that it served as the gateman’s residence. Over the years the estate was passed down to relatives and eventually sold to a realtor who used the—newly titled— “Marble Arch building” as his offices. 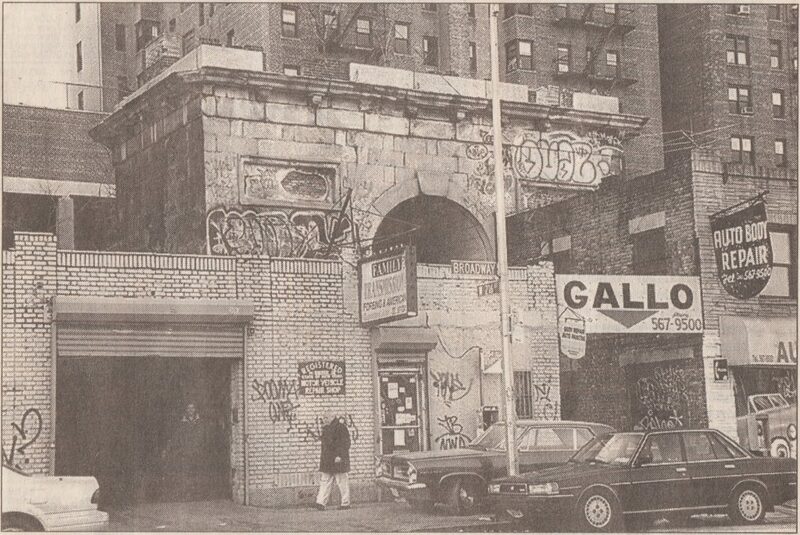 He sold off much of the land and eventually garages and car dealerships engulfed the Marble Arch. 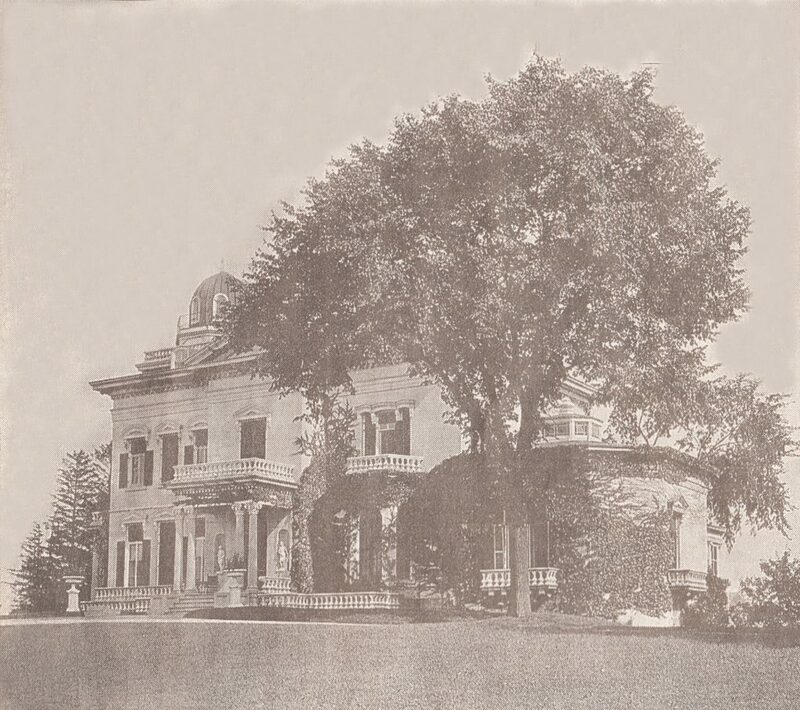 In 1938 the mansion was demolished and replaced with apartment buildings. The only structure that remains from that once great estate is the arch which, in a sad state of disrepair, serves as the entrance to an auto body shop. A number of year ago, traveling to the Bronx on the 1-train I would often pass this huge arch and wonder what it was doing there as it obviously didn’t belong to the landscape surrounding it. So one day, out of pure curiosity, I got off the train and walked up to the building to take a look. Asking around, I learned a little bit of its recent history—all sad—and eventually did some research where I discovered the structure’s origin. As I was sitting in the library going through reels of microfilm it suddenly occurred to me that this building and the mansion to which it once served as an entranceway, was the physical embodiment of the story that THE MAGNIFFICENT AMBERONS told. As with the Amberson Mansion and the family that once called it home, the Seaman family and their wealth had all disappeared except for this sad reminder of their past magnificence which, as with the Amberson mansion, a dark city eventually engulfed. I cannot express how moved I was in that library as the story of THE MAGANIFICENT AMBERSON suddenly become a tangible reality. I immediately understood the film as an incisive look at the impermanence of life and of all the things that we presume lasting but, in truth, are merely as impermanent as a dissipating morning mist. It was right then, at that very moment that I realized the greatness of the film Welles originally made. Aware that the film had been cut and changed by the studio prior to release, as soon as I learned about the Robert Carringer book, “The Magnificent Ambersons: A Reconstruction” and the cutting continuity that it contained of the full version, I practically ran to the Lincoln Center Library to learn for myself the film Welles had made before it was edited down. 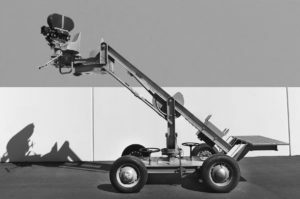 Instead, I was forced to decipher the technical language of a studio cutting tool and not anything close to something designed to give the reader an idea of the rhythm or tone of the film. After two hours, eight pages and the onset of a headache, I finally gave up. I did learn what scenes were missing, I learned what scenes had been changed but as far as getting a true sense of what Welles’ film was like in its original form I drew a complete blank. It was my mistake to ever have thought the book would ever give me this. Carringer’s book was designed to be a definitive account of what happened to THE MAGNIFICENT AMBERSONS after Welles left for Rio so that future film historians and writers (like myself) would finally get the story right and, so, accurately inform their own accounts on this subject. It was not Carringer’s intention to re-create the look and feel of the original film. So, for the time being—and for me—that was that. A number of years later I finally read a reprint of Carringer’s incredible and definitive account on the making of CITIZEN KANE. Extremely impressed by that book and the chapter in which the author discussed AMBERSONS, I decided to give Carringer’s AMBERSONS book another try. This time I was armed with my own copy, a DVD of the release version that I watched repeatedly and the complete Bernard Herrmann score now available on CD. So each night before I went to bed, I would turn on the CD, make sure to play the music that went with each cut scene, and slowly—keeping my eyes closed while I re-constructed the scenes in my imagination—I used the music to give me the tone and feel of the lost scene. By this point in time I had become so familiar with the scenes and performances in the existing film that it was easy for me to imagine how the actors spoke and in my mind actually heard the dialogue in their voices. It took me several months but I finally had some sort of idea of the complete film although the final scene, the scene Welles considered the best in the film, continued to allude me. That is until I found and played the original “No news, What Killed The Dog” recording that was heard through most of the scene and gave it the poignancy that brought the scene alive for me. So, after that I suddenly felt compelled to do this site. Taking Herman Weinberg’s “The Complete GREED” as my inspiration – and using the 131 minute continuity, frames stills and storyboards from the film – I did my best to reconstruct THE MAGNIFICENT AMBERSONS as it existed when Orson Welles received that 131 minute print in Rio during March 1942. Unfortunately, it was a version of the film only seen by handful of people; mostly RKO employees. What many don’t know is that the versions of the film audiences saw at the infamous Pomona and Pasadena previews were never the complete film but revamped versions that ran 110 and 117 minutes respectfully. Today, after recreating the film in my mind and, after doing my best reconstructing it for this site, I no longer see – or think – of the film in terms of the 88 minute release version. I now “see” the 131 minute cut, a film that many who did see it, considered one of the greatest if not the greatest film ever made. Thus, the purpose of this site. I wanted everyone who was interested in THE MAGNIFICENT AMBERSONS to think of it as I did and as Welles conceived and made it. In an attempt to make this as complete an AMBERSON site as possible I have also included everything that I could find pertaining to the film including stills, posters, the original book, the 1939 radio program based on it, the film’s shooting script, correspondence and the liner notes for the CD containing Bernard Herrmann’s complete score. Thus, I wanted everyone who comes to this site to leave it with an idea of what the film was intended to be and would have been if things had been different; Welles follow up masterpiece to CITIZEN KANE and a film that could stand side by side with it. First of all, comparing CITIZEN KANE to THE MAGNIFICENT AMBERSONS is like comparing apples to oranges. The two films (and I am speaking of Welles 131 minute AMBERSONS rough cut) should never be seen as competitors but rather as companion pieces demonstrating Welles’ versatility as a film maker. KANE is a film about ‘film’ in its demonstration of what could be done with film form. Nothing like it had ever been attempted in American cinema prior. It is a magic show with each scene more marvelous and fantastic than the previous one. In terms of content, it did have something to say both psychologically and thematically. But with CITIZEN KANE the medium was really the message which is why it has had such a profound influence on so many films that followed. Yes, the film does contain some technical marvels that rival KANE. No doubt the ball sequence in its original form is probably one of the greatest technical feats in Hollywood film making up to that time. But, unlike Kane, it is done with a light touch so it doesn’t bring attention to itself as say the Breakfast Table sequence in KANE or Kane walking into the photograph of the newsmen. Welles applied that same light touch to the famous buggy ride with George and Lucy. The shot is designed to make the scene feel less like a movie and we, the audience, more ease droppers experiencing the scene. This is true of much of the film. If you break AMBERSONS down a little less than 55 percent of the film is done in single or two take scenes some of which were filmed entirely from a single angle. In AMBERSONS the medium is not the message, it is merely a tool brilliantly used by Welles to tell his story the best way he could. In this respect, the film is almost the antitheses of KANE. Thus, making any effort to determine which of the two is the greater film an exercise in futility. There simply is no comparison. Each achieves greatness on its own terms by its own means which is exactly what Welles intended. Contrary to much that has been written and what Welles himself has said in later years, Welles was deeply involved in the revamping of AMBERSONS. After the first preview, by contract, RKO could take control of the film but allowed Welles to do a recut in order to improve the film’s commercial prospects. He sent his suggested changes from Rio and they were implemented at RKO. After seeing this cut, and realizing that Welles hadn’t solved the commercial issues, RKO took control and turned the film over to its editor, Robert Wise—the editor of CITZEN KANE—to prepare for release. Welles was absolutely devastated and severely shaken not only by the infamous Pomona preview but also by comments about the film made by friends and people he trusted. His confidence in the film severely shaken, he was now willing to do whatever needed to be done to save HIS movie. Thus, contrary to popular belief, Orson Welles was an active participant in the process of re-shaping his film. Welles continued sending suggestions some of which Editor Robert Wise used and some that he didn’t. All but two of the reshot scenes were written by Welles and many of his suggestions were incorporated into the film. At one point some of the cuts he suggested were even more severe than the ones Wise wanted to implement. In later years he labeled this “bargaining” as it was his attempt to save as much of HIS film as he could. So, except for the final two scenes Welles took part in the re-shaping of AMBERSONS. Welles finally withdrew his participation when the original ending was cut and replaced. So, the last two scenes in the existing movie were written by someone else and it was at this point that Orson Welles disowned the film as the removal of the film’s original ending had so radically changed HIS film that he could no longer call it his. In the 80s Welles watched AMBERSONS on television but shut it off after Major Amberson’s death stating that it was pretty much his film up to that point but, after that, it became their (the studios’) movie. It is common knowledge to anyone familiar with the film that elderly actor Richard Bennett, playing Major Amberson, could no longer remember his lines and Welles had to feed them to him as he shot a scene. Consequently, several writers have speculated that because of this some of Bennet’s lines were given to other actors. This is a total and complete falsehood. Bennet spoke every line given the Major in the script. In adapting the book to script the Major’s lines at the dinner for Eugene—in response to George’s outburst—were given in the film to Jack Amberson to strengthen the Jack Amberson character. This is in the script. Yet some writers have also suggested that due to Bennett’s inability to remember lines, the second Porch scene was lacking and why it was removed before the first preview. This is another speculative falsehood. Throughout the film Bennet’s performance in scene after scene as Major Amberson is flawless and as strong as any performance in the film. That being the case, it is highly unlikely that he suddenly falls short in the second Porch scene. In addition, Welles loved Bennett and considered him one of the greatest actors he had ever seen on the stage. Respect for Bennett boundless, Welles did everything possible to ensure that Bennet would give a wonderful performance and with the evidence up on the screen, he succeeded. As a result, today Bennett is not remembered for his half century on the stage giving great performances but, instead, as Major Amberson in THE MAGNIFICENT AMBERSONS. This was Welles’ gift to a great actor. For the record, most of interiors for THE MAGNIFICENT AMBERSONS were photographed at RKO’s Culver City lot; 40 acres or Pathe as it was called at the time. Because this lot was not part of RKOs main facility, although RKO occasionally used it, for the most part the stages and office-facilities were rented out. Between 1935 and 1940 the lot was taken over by David O. Selznick where he made all his Selznick International Pictures including GONE WITH THE WIND and then again in the mid-40s until 1949 when Selznick ceased making films in Hollywood. This is why the Culver Colonial Style office building became the Selznick logo. Consequently, the sound stages and some of Culver’s standing backlot sets from GONE WITH THE WIND were used in THE MAGNIFICENT AMBERSONS. 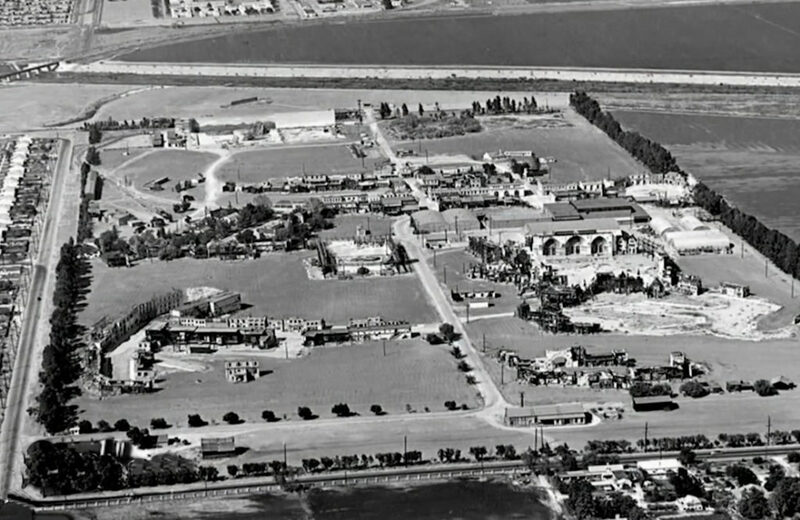 In the 1980s the standing sets were demolished and the backlot sold off and turned into an office park. ONE OF THE EXTENDED BALL SHOTS BEING REHEARSED AND THE RESULT. NOTICE THE BREAK AWAY WALLS. An interesting side note is that the Culver Studio had stages with wooden floors. So during the famous Amberson ball sequence and it’s minutes long un-interrupted takes, while the dolly-crane seemed to effortlessly move through, in, and around rooms, a 100 member crew worked to pull apart breakaway walls, adjust mirrors, realign lights, yanking other walls up out of the way and then putting everything back together when the camera was turned on them again. In addition the sound stage’s 30 year old wooden floors creaked under the weight of the huge crane. Consequently, if the original soundtrack recording could be heard, it would sound more like a noisy factory than the elegant Amberson ball. Part of the legend of AMBERSONS is that David Selznick upon seeing the long version suggested to RKO that a copy of the original cut should be donated to The Museum Of Modern Art. Some writers have argued that this is highly improbable as they question when Selznick could have seen the original and in fact, which version he might have referred to. 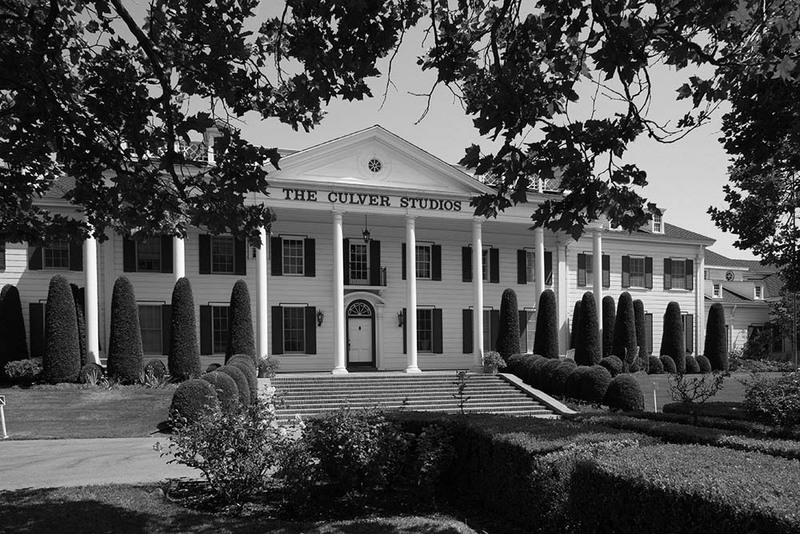 First of all, even though Selznick had taken a four year hiatus from film making, Selznick still kept offices at the Culver Studios where Ambersons was shot. Second, cinematographer Stanley Cortez was under contract to Selznick when RKO borrowed Cortez for the film paying Selznick for Cortez’ services. As such it would be highly beneficial to Selznick to see Cortez’ work as soon as possible since if Cortez did well, he would become a more valuable asset for Selznick. In fact he did because Cortez was nominated for an Oscar for AMBERSONS. It should also be noted that the Mercury publicist set up screenings of the long version for the press prior to and even after the previews. That being the case, it would have been an easy matter for Selznick to see the film in its original form as it just meant a short walk from his office to a screening room. And, in those days no one said no to David Selznick. THE MAGNIFICENTAMBERSON did not ruin Welles directing career in Hollywood. On the contrary, the film was well reviewed and even nominated for four Oscars including best picture of the year. Cost overruns and bad previews have happened to other directors who have enjoyed long Hollywood careers. What made Welles unemployable for a time as a director was IT’S ALL TRUE. While in Rio, Welles spent $526,000 of RKO’s money (with another $595,000 needed to complete the film) but when he returned to Hollywood—by this time RKO had already evicted Mercury off the lot—he could not put his film together into any reasonable form that the studio felt was worth finishing or releasing. Not since QUEEN KELLY had anything like this happened—a director being solely responsible for shelving an uncompleted movie. Since IT’S ALL TRUE was the second film of Welles’ first, “Final Cut,” contract, RKO couldn’t do anything with it without Welles’ permission. So, Welles attempted to persuade other studios to buy the footage so he might complete the movie. All but Fox turned him down and Fox, before committing, wanted to see some assembled footage. In fact, during the making of JANE EYRE (for which he was the defacto producer) Welles had a moviola on the set and in between takes was cutting the film. Viewing the sample footage Fox finally turned Welles down but in the mid-40s he worked out a deal to purchase the footage from RKO for $200,000. Unfortunately, unable to raise the funds, the footage languished in the RKO vaults until much of it was discarded in the 1950s. It was after the IT’S ALL TRUE debacle and not AMBERSONS that the Hollywood studios felt they couldn’t trust Welles with their money and the reason why he didn’t direct again until 1945 and then, under severe restrictions. Construction costs for the sets to THE MAGNIFICENT AMBERSONS were among the largest for the period – surpassing even those for GONE WITH THE WIND. Most of the construction budget was devoted to the three floors of the Amberson Mansion where most of the interiors scenes were shot. Soon after the completion of filming, as the stages were needed for other productions, the sets were taken down. The only part of the mansion left intact was the staircase and it was used in several RKO films—mostly horror movies—before finally being dismantled in the mid-40s. Almost all the exterior location scenes for AMBERSONS were shot at the RKO Ranch in Encino using standing sets except for Mrs. Johnson’s House and The Amberson mansion (or just the entrance as in the film the rest of the house was a matte painting). These two sets were constructed for the film. MRS. JOHNSON’S HOUSE WAS OFTEN RE-USED, MOST FAMOUSLY IN “IT’S A WONDERFUL LIFE” AS GEORGE BAILY’S HOME. WHEN THE JOUNSON HOUSE WAS USED IN “IT’S A WONDERFUL LIFE” IT WAS MOVED TO THE STANDING RESIDENTIAL STREET. 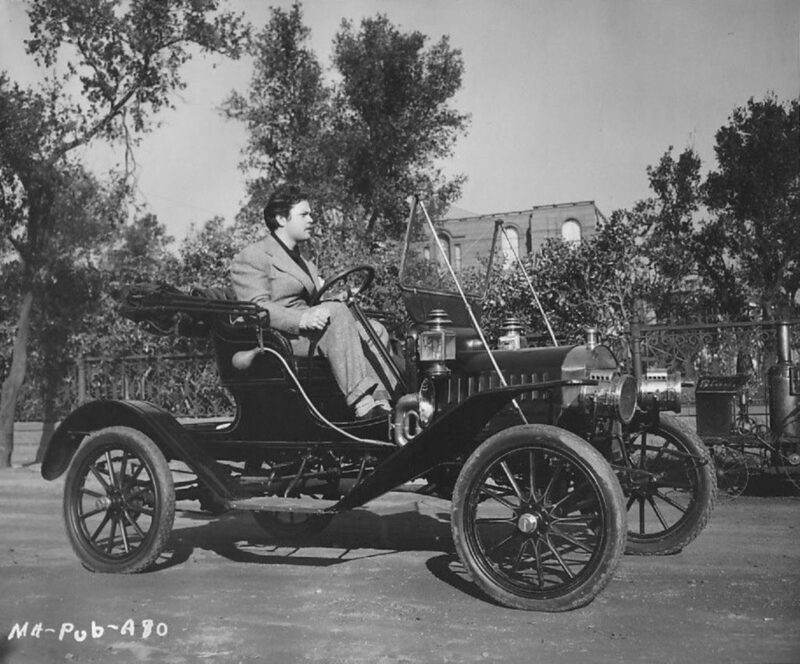 THE MANSION FACADE – SEEN BEHIND WELLES DRIVING AN AINTIQUE AUTO – WAS ALSO LEFT STANDING AFTER FILMING. The Amberson Mansion façade, at the lower left, was still standing when this photograph was taken in 1953. 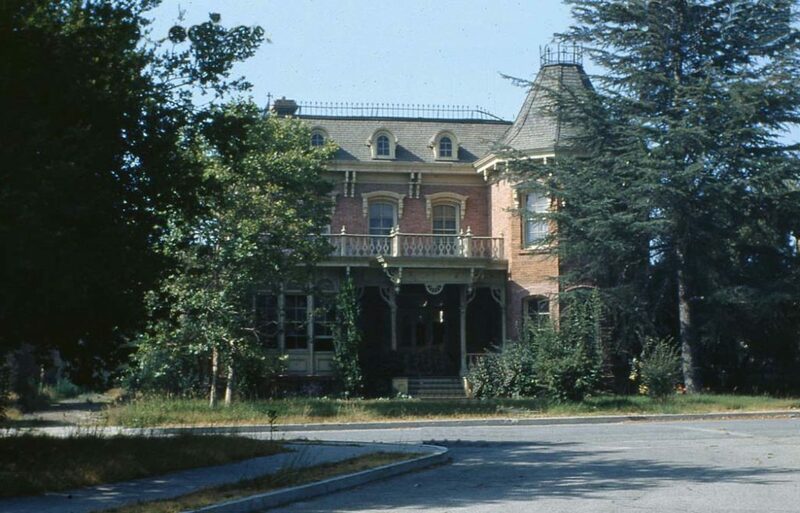 In 1954, the Mansion façade, the Johnson house and the main street set – used for the buggy ride and Lucy and George’s walk – were all demolished when the entire 89 acre Encino Ranch was sold and raised for a housing development called Encino Village. As hard as this may be to believe, costumes from the film have actually survived and occasionally come up for sale at costume auctions. Below are three AMBERSONS costumes designed for cast members. As they were the property of RKO they were enviably re-used in other RKO movies. This first costume was worn by Isabel in one of the scenes deleted before the 131 version was prepared. Isabel follows George up to the empty third floor ballroom after George speaks with Jack in the Bathroom. Although, the second has a label attached with “CP-570-Period 1880 Moorhead” I couldn’t place it in the movie. Therefore, the Moorehead costume may have been replaced by a similar costume before filming began, most likely for the scene at the beginning of the film where Fanny and Mrs. Johnson gossip about Isabel. 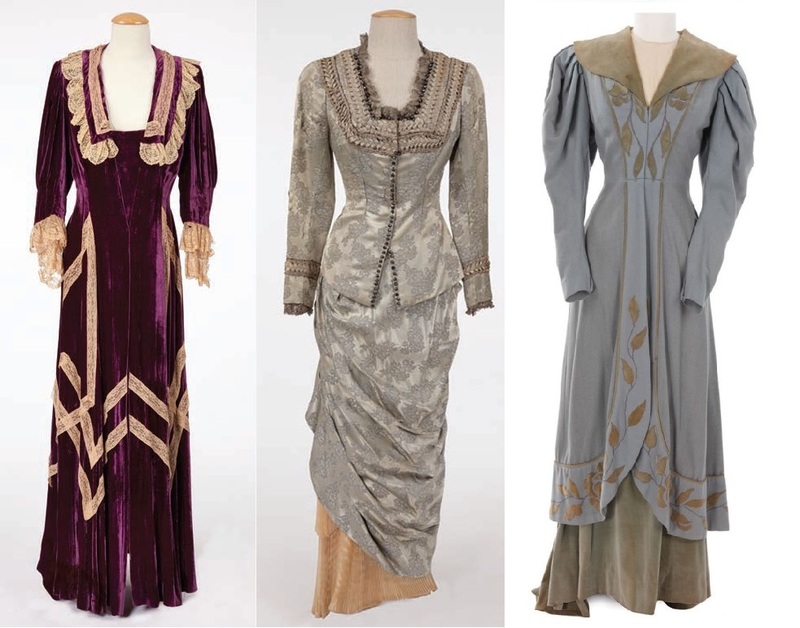 The third dress has the label “2946 (1905) Costello” and was also used in a scene deleted before the 131 minute version was prepared. In that scene Isabel and her husband Wilber bring four year old George to church while Mrs. Johnson and her friends look on.